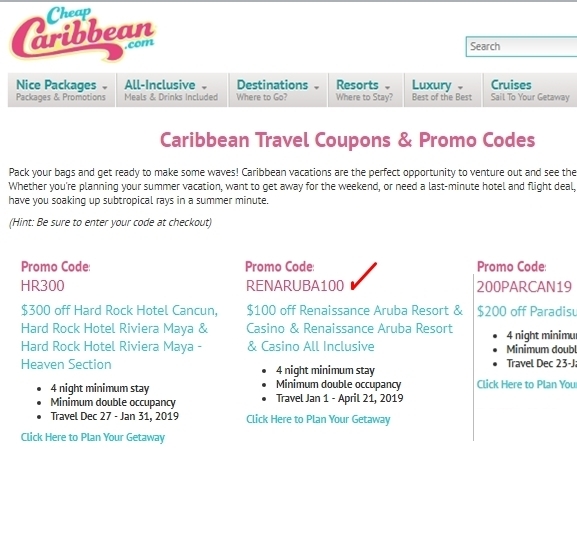 Redeem the coupon with the button, or use this link: http://cheapcaribbean.com. Expired 4d ago . Last validated 3mo ago . Used 4 times. Allen Miller $100 off Renaissance Aruba Resort & Casino & Renaissance Aruba Resort & Casino All Inclusive. 4 night minimum stay. Minimum double occupancy. Travel Jan 1 - April 21, 2019.